There are plenty of such jQueryFrom validation techniques available, which you can perform on your own by simply following instructions or by exploring different tutorials. Some of these tutorials are the basic validation techniques. Most of the tutorials have validating forms made from PHP and iQuery in the client side as well as the server’s side. Once the form has been validated, the developers have to reload it. Sometimes, this process can turn out to be a loss of some content. With the right validation techniques, a developer can learn to validate the forms along with making sure that the pages are kept unchanged. In this way, you are prevented from loss and the whole process can be eased. With the best techniques, the developer can conceal as well as reveal the inputs according to his requirements. The inputs can then be used for applying the styles that you can let you manage the inputs together. Making an advanced web form has become simple. You can use jQuery for hiding and showing the inputs as per your requirements. There will be 3 plug-ins used. One will be meant for applying fancy styling, one will be used for validating, and the last one will be used for serializing the inputs as well as AJAX submission. PHP will be used for saving the users’ name and email address to send the actual email. There is a number of plug-ins now available that can let you create simple as well as powerful form validation. It is a lightweight and flexible solution to build the page from scratch. You can use the jQuery validate plug-in for this purpose. This will not be as much advance and powerful as the official plug-in will be. If you want to create a form validate by using a simply way to ensure best user experience then the best way to do so is by adding form validate to WordPress comments using jQuery. 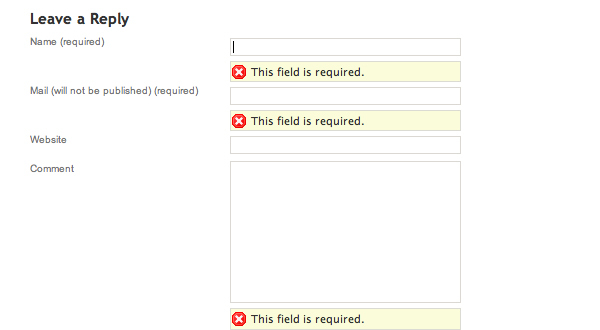 Your form validation will happen fast on the same page. It will be much better than reloading the pages and increasing the chances of losing some of the content. Follow this tutorial to use this technique. You can use the most controlled plug-ins for making the contact forms. A custom page template can be used for creating a contact form in WordPress without using a plug-in. For this purpose, conditional statements are used in order to determine the form submission status (submitted or not). Follow this tutorial to use this technique. If you will learn to implement these techniques successfully then form validation will become easier for you. You can utilize template of even a customized page for developing a form. If you get to learn the right techniques of doing the work then you can reduce the chances of errors and can make a flawless form that will be easy to use as well as understand.